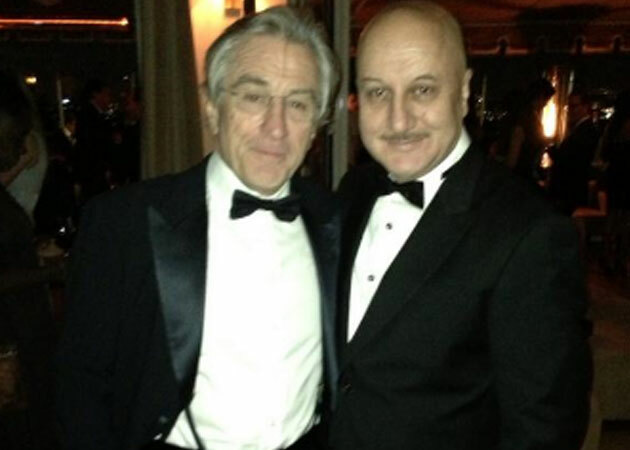 Anupam Kher and Robert De Niro at the SAG awards. This picture was posted by Anupam Kher on Twitter. After sharing screen space with Robert De Niro in Oscar-nominated film Silver Linings Playbook, Anupam Kher is now making a short film in tribute to the Hollywood veteran. I Went Shopping For Robert De Niro, a 29 minute short film in honour of his Oscar-nominated co-star, is Anupam Kher's next directorial venture. He is also producing the film under his banner Actor Prepares Mumbai, named after his acting school. "I have been wanting to direct a film for the past one year. When I came back from the USA after completing Silver Lining's Playbook, Yamini, the writer of the short film, narrated the concept to me and I thought it is a wonderful story and I wanted to tell it. I decided to direct and produce it," said Anupam Kher in a statement. The cast and crew includes fans of De Niro, who have worked passionately to pay their respects to the 69-year-old actor. I went Shopping for Robert De Niro is a story of two girls at the crossroads of their lives and what happens to them on that particular day when they go shopping for De Niro. Yamini Kshirsagar and Rimal Arora play the lead roles in the film. The pair had actually gone shopping for a gift for De Niro before Kher travelled to Philadelphia to shoot Silver Linings Playbook, making the film part autobiography and part fiction. "With this film we tell the story of millions of people who come to the city of Mumbai to fulfil their dreams. It reminded me of the days of my life when I shifted to Mumbai to pursue my career as an actor. "Similarly Silver Linings Playbook reminded me of the excitement I experienced when I signed my first film ever and I went shopping for Robert De Niro reminded me of my first days in Mumbai. Nostalgia drove me to be a part of both these stories," said Anupam Kher, who is currently riding high on the success of recently released Hindi film Special 26.